SHADOWS OF SELF sees the return of Waxillium Ladrian, trying to balance his responsibilities as a lord and a lawman. When the Governor’s brother is murdered whilst hosting the cities corrupt noblemen and women, Wax is quickly drawn into the investigation. With the city falling apart and the killer always preternaturally one step ahead, Wax is forced to come uncomfortably close to accepting the possibility that this is one case he simply can’t handle. In the same style as ALLOY OF LAW, Wax ends up once again drawn into a tangled mess of crimes, mysteries and thrilling experiences. There is a distinctly Wild West feel to these Era 2 novels that widens the genre and brings a completely new aspect to the fantasy landscape. I really enjoyed this crossover and as a reader who usually avoids crime and thrillers, this sideways introduction might encourage me to give some of the more traditional novels in this genre a try. My absolute favourite features of the Wax and Wayne novels are the subtle nods to the original trilogy. While ALLOW OF LAW and SHADOWS OF SELF can both be appreciated without having read the Mistborn books, Wax’s thrill being at one with the mists is so beautifully aligned with my memories of the first novels. It’s incredibly nostalgic to read about the religions dedicated to serving Kelsier, Vin and Sazed as well as revisiting old places with new characters. 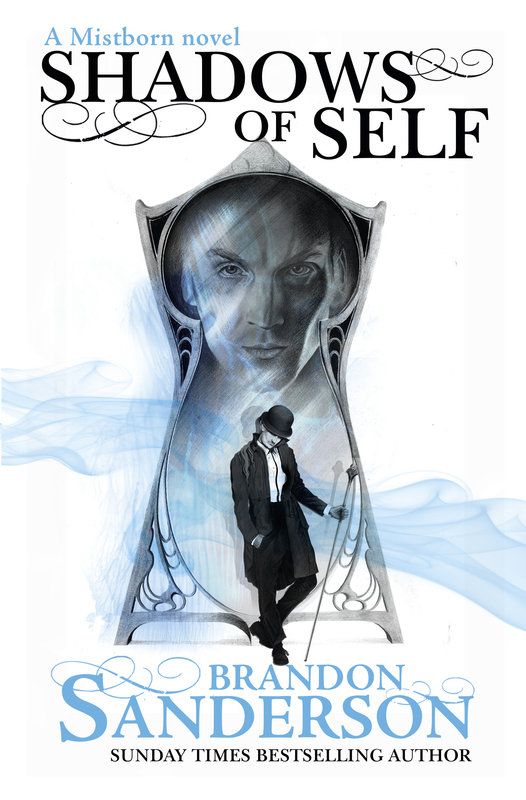 As what is essentially the fifth book of a series, at first SHADOWS OF SELF doesn’t seem to have much scope for building on an already well established world. But, of course, this is Brandon Sanderson we’re talking about. Taking on the industrial boom of Scadrial, where Kelsier and Vin once raced through Elendel’s streets in darkness, Wax now flies above motorcars and electric lights. It’s amazing to see such a familiar world through fresh eyes and I loved getting to know this newly developed Scadrial 300 years after the main events. Even since ALLOY OF LAW there has been rapid development in weapons and transport; this world is vibrant and free from the ashes that plagued Vin’s era. The new characters continue to develop and I’ve really grown to like the determined Marasi more and more throughout these novels. She has just the right amount of impatience and tempestuousness thrown in with her intelligent and determined demeanour. Wax continues to be brilliant and terrible in equal measure, making reckless decisions that both serve his pride and protect his people. We see the return of some huge characters and creatures from the Mistborn trilogy to shake the plot up and I’m very excited to see where Brandon takes the future books. The twists were just that little bit more sophisticated, complete with a truly unpredictable and devious villain, and the pace is pitched perfectly, keeping the narrative steaming ahead straight into a shattering conclusion. Dropping some serious bombshells towards the end, it’s clear that Wax, Wayne and Marasi definitely have a lot of story left to tell. I received SHADOWS OF SELF from Orion in exchange for an honest review. My reviews always represent my own opinion.